Stem cells are a diverse class of cells that share the ability to self-renew and to differentiate into multiple cell types. 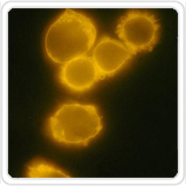 CD34 is a cell surface glycoprotein expressed on the surface of various cell types. It works as an adhesion molecule with a role in early hematopoiesis but serves as a cell-cell adhesion factor in a variety of circumstances including stem cell attachment to both bone marrow and stromal cells. Regardless of its function within a cellular process, CD34 facilitates cell migration making it an excellent maker for a range of research areas. 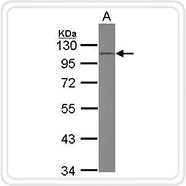 ICC/IF analysis of human myeloid lukemia cell line MOLM-7 using CD34 antibody [4H11(APG)]. 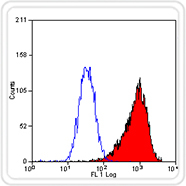 WB analysis of THP-1 whole cell lysate using CD34 antibody [N1C1] at a 1:500 dilution. GeneTex has a large list of antibodies to chose from. Below is a small segment of our entire catalog. Stem cells are a hot topic right now, for both ethical and technological reasons. However, many people do not really understand what stems cells are and how they can be used. There are a variety of sources of stem cells, as well as many different potential and practical uses that they are associated with. In any organism, the cells that make up the adult animal are differentiated. This means that they perform functions specific to where they are in the body. For example, a skin cell does not perform the same tasks as a brain cell. Typically, these cells cannot change into another type of cell, and can only divide to create more cells of the same type. Stem cells are undifferentiated cells that can still become many different types of differentiated cells. They are commonly found in human and animal embryos where different organs and bodily tissues are still being formed. However, adult humans and animals have some types of stem cells as well. Because stem cells can divide into many different types of cells, they could potentially be used to replace faulty cells in the body. Scientists know how to induce stem cells to turn into certain other types of cells, but they are still working on how to best treat diseases with them. There are a great number of issues surrounding the problem, including ethical and practical ones. Embryonic stem cells were the first to be discovered and isolated. In 1981, these cells were isolated from mouse embryos and were found to be able to turn into any tissue in the body. Adult stem cells were found later, during the 1990s. Adult stem cells are not capable of becoming any tissue in the body, but can become different types of tissue associated with a certain part of the body, such as a blood or brain cell. It has been known since the 1960s that bone marrow in adults contains stem cells. These cells can be used in transplants because they will differentiate into all of the different but necessary types of cells in the blood. However, it was not known that stem cells like these existed in other parts of the body. During the 1990s and beyond, scientists found more of these cells in other areas of the body, such as the brain. They are an active area of investigation, because propagating a person's own stem cells could provide a replacement for faulty heart valves or other tissues. However, adult stem cells are relatively rare and limited in growth potential once removed from the body. In 2006, science made another discovery, which was that some of these adult stem cells could be reprogrammed into an embryo-like state referred to as pluripotent. This means that the cells again had the potential to become any tissue in the body, not just a range of limited tissues. One focus of stem cell research is called cell-based therapy. This involves using stem cells, either embryonic or adult, to create new tissue that can replace the old damaged or diseased tissue. It is mostly still in the experimental phase, with certain exceptions such as bone marrow transplants. Laboratory studies have suggested that under certain conditions, stem cells can regenerate tissue in animals. Rats with damaged hearts that were injected with stem cells gained improved heart function. However, it is not yet known how the stem cells increased heart function, which is crucial to learning how to use them in humans. Another area of research involves laboratory cell lines. Creating cells with the properties of the various tissues in the human body would allow the screening of drugs and other compounds to see what their effect is. This is already done with cancer cells, which are cultured in the laboratory and used to test whether anti-tumor drugs are effective. Stem cell markers are proteins on the surface of the cell that react with or bind to other proteins. 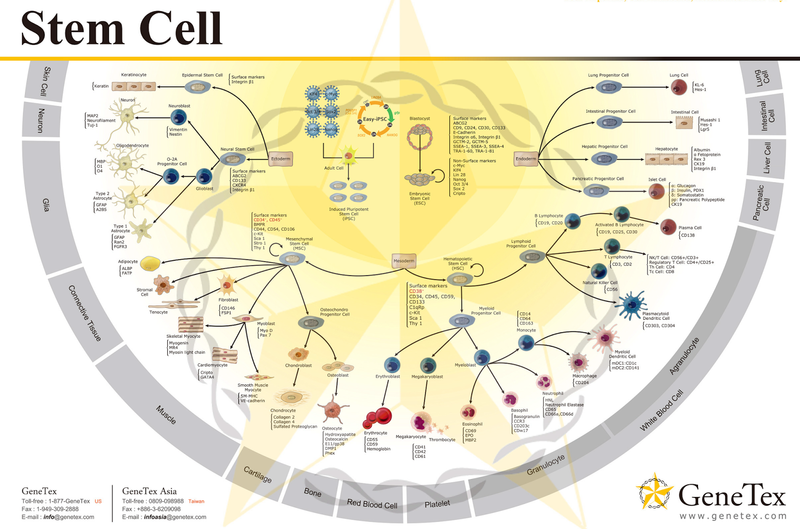 Each type of cell has a unique array of markers on its surface. Scientists can locate and identify specific types of stem cells by introducing agents that bind to these specific markers, such as fluorescent compounds. Markers are an important tool for finding adult stem cells, which may make up less than 1/100,000th of cell populations. Many stem cell types have been characterized by the presence or absence of certain markers. Unfortunately, no single marker or set of markers that will identify all pluripotent cells has been found. An intracellular junction is a highly specialized region of the plasma membrane that can be found within the tissues of multicellular organisms and serves to maintain cell and tissue polarity and integrity. These junctions consist of multiprotein complexes that provide contact both between neighboring cells and between cells and the extracellular matrix. Intracellular junctions also build up the paracellular barrier of epithelia and control paracellular transport. 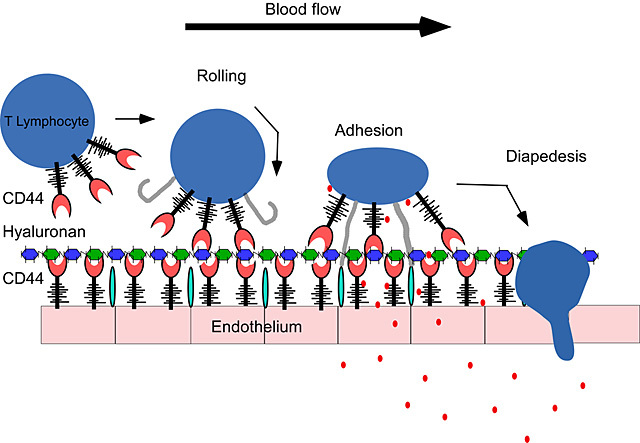 Various types of cell adhesion molecules are involved in the construction of intracellular junctions including selectins, cadherins, integrins and the immunoglobulin superfamily. The three major types of cell junctions found in vertebrates are adherens junctions, gap junctions and tight junctions. Adherens junctions, also referred to as zonula adherens or intermediate junctions, are defined as cell junctions in which the cytoplasmic face is linked to the actin cytoskeleton. They can appear as either bands encircling the cell or spots of attachment to the extracellular matrix. Adherens junctions are composed primarily of cadherins, p120, alpha catenin and beta catenin. Gap junctions are specialized intercellular connections that are found between multiple types of cells. They are composed of two connexons that connect across the intracellular space. These junctions directly connect the cytoplasm of two cells and allow various molecules and ions to pass freely for direct electrical communication between cells. Tight junctions, which are also referred to as zonula occludens, are formed when the membranes of closely associated areas of two cells join together to form a virtually impermeable barrier to fluid. One of the functions of tight junctions involves the preservation of transcellular transport. Tight junctions maintain the polarity of cells by preventing the lateral diffusion of integral membrane proteins between the apical and lateral/basal surfaces. This allows the specialized functions of each surface to be preserved. Tight junctions are also involved in the prevention of the passage of molecules and ions through the spaces between cells. The study of junction assembly and remodeling on the molecular level is a rapidly growing area of research. Studies that address the fundamental properties of junction dynamics will most likely further reveal the complexity of these specialized organelles. In the body, neural stem cells are found near blood vessels in the subventricular zone, the hippocampus, and the songbird higher vocal center. The cells in the ventricular zone release vascular endothelial growth factor (VEGF). Because blood vessel growth is attracted to VEGF, the vascular cells are near the central nervous system germinal zones. Scientists have suggested these cells provide a neural stem cell niche. In order to investigate the relationship between the neural stem cells and vascular cells, researchers in the Center for Neuropharmacology and Neuroscience, the Center for Cardiovascular Sciences, and the Center for Cell Biology and Cancer Research at Albany Medical College cocultured vascular cells and neural stem cells. In transwell plates, mouse neural stem cells were seeded in the well bases and vascular type cells were seeded in the upper compartment of the wells. Various types of vascular cells were studied, including primary bovine pulmonary artery endothelial (BPAE) cells, vascular smooth muscle (VSM) cells, mouse brain endothelial (MbEND) cells, and NIH3T3 fibroblasts. High-density, age-matched cortical cells (CTX) were used as controls. When BPAE and MbEND cells were used in the upper compartments, the endothelial cells were not found in the lower cells because they could not fit and migrate through the pores. Within one day of cell seeding, the neural stem cells cultured with the control, CTX, started creating neurons. The neuron growth was mostly in glial lineages. However, cells cultured with BPAE or MbEND grew into sheets of flattened progeny. Stem cells cultured with endothelial cells produce fewer neurons and larger stem cells, as compared to cells grown with CTX. Researchers concluded that endothelial cells aid in expansion of neural stem cells, but inhibit cell differentiation. VSM and NIH3T3 cells were also found to promote stem cell proliferation. After researchers removed the transwell inserts, endothelial-expanded stem cells proliferated and differentiated. Approximately 31% of the progeny produced were neurons, while only 9% of stem cells cultured with CTX were neurons. Neural stem cells cocultured with BPAE contained as much as 64% neurons. However, neurogenesis was reduced in the stem cells cultured with VSM or NIH3T3 cells. Therefore, endothelial cells’ affect on neurogenesis in neural stem cells depends on the cell type and is not universal across all endothelial cells. Scientists also found that endothelial cells activate proliferation and neurogenesis of neural stem cells in a variety of areas in the central nervous system (CNS). Another type of stem cells, neurosphere-expanded stem cells, was also influenced by endothelial cells. When exposed to the endothelial cells, neurosphere-expanded stem cells created 22% neurons, compared to 2% neuron production in control cells and CTX. 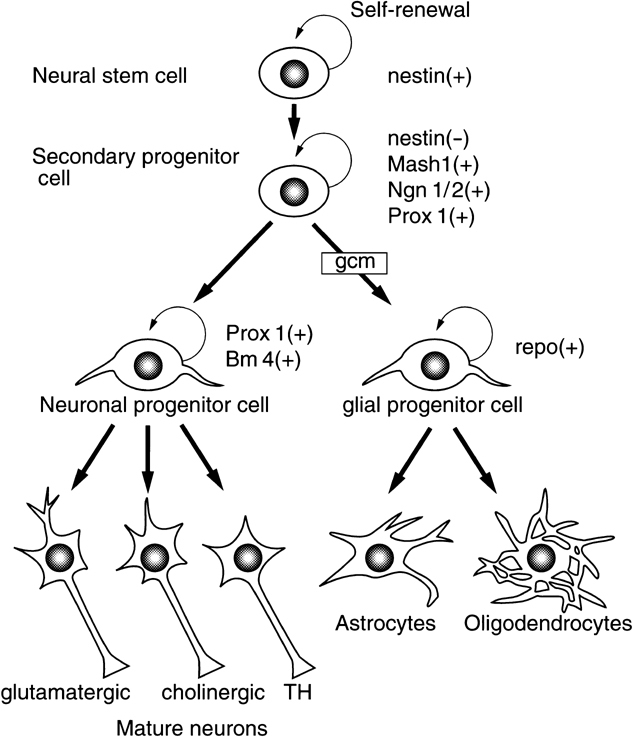 In the body, most neurons are produced in the early embryonic stage, but interneurons and glia arrive later, typically in adult stem cells. Stem cells were cocultured with endothelial cells and stained for glutamic acid decarboxylase, an interneuron marker, or Tbr1, an early neuron marker that labels projection neurons. Endothelial cell coculture produced more projection neuron and interneuron markers than the controls. Additional signaling experiments also demonstrated that endothelial cell and neural stem cell coculture activated the signaling molecules, Notch and Hes1, which promote neural stem cell self-renewal. Through this research, scientists demonstrated that endothelial cells release some type of factors that maintain central nervous system stem self renewal and neurogenesis. In the presence of these endothelial cells, neural stem cells undergo proliferation to produce sheets of undifferentiated stem cells that can generate neurons, astrocytes, and oligodendroctyes. The growth of stem cells in the presence of endothelial cells may be important for neuron replacement therapies. If researchers can isolate the secreted factors from endothelial cells that cause neurogenesis and capture it in a drug, patients that have lost nerve function may be able to regrow their own neurons through neural stem cell self-renewal and neurogenesis. The CD44 antigen is a glycoprotein that is found on the surface of many cell types, including resting T cells, and is involved in cell-cell interactions and cell adhesion. CD44 acts as a receptor for hyaluronic acid and plays an important role in cell migration, including the recruitment of effector T cells and other leukocytes to infection sites. CD44 also participates in lymphocyte activation, recirculation and homing, as well as hematopoiesis and tumor metastasis. The function of CD44 is controlled by posttranslational modifications including proteolytic cleavage, N- and O-glycosylation and phosphorylation. Due to an increase in its expression following the activation of B-cells and T-cells, CD44 can serve as a valuable marker for memory cells. Furthermore, the upregulation of CD44 expression is sustained on effector cells and memory cells after the immune response has subsided, so CD44 expression can also be used as an indicator of prior exposure to an antigen. However, little is currently known about its function of T cells. Recent studies have suggested that the CD44 signaling pathway may be involved in ensuring proper T cell effector responses by providing contextual signals at various anatomical sites. CD44 ligation may also promote T cell survival through the augmentation of T cell activation in response to an antigen. Studies also suggest that CD44 may contribute to both the regulation of the contraction phase of an immune response and the maintenance of immune tolerance. Furthermore, CD44 may play a role in ensuring the functional fitness of memory T cells once the memory stage has been established. In addition to its function on T cells, current research is also focusing on CD44 as a potential therapeutic target for controlling inflammation. Early studies have shown that the blocking of CD44 results in a reduction in skin contact sensitivity responses due to a decrease in lymphocyte and leukocyte infiltration. Other studies have shown that pulmonary injury and allergic responses are reduced following treatment with CD44 antibodies. Additionally, interfering with CD44 function has shown therapeutic potential for the treatment of arthritis, multiple sclerosis, colitis and type 1 diabetes. However, a better understanding of the multiple, distinct roles of CD44 in various cell types will be required to fully realize the therapeutic potential of CD44 inhibitors. Stem cells and anything that has to do with them are certain subjects of fascination in today’s world. These tiny components of our bodies seem to promise indefinite health and well-being, as well as the reversal or cure of many modern and ancient maladies. Since stem cells are not yet specialized and can turn into virtually any kind of cell that the human body needs, doctors believe they can replace ailing organs and otherwise rejuvenate flesh with them. Stem cell markers are another facet of this medical phenomenon that stirs up great interest in every part of society. What Are Stem Cell Markers? 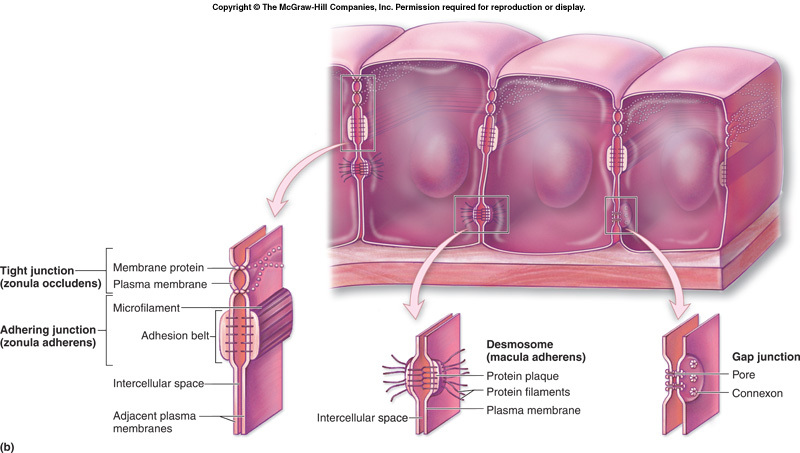 Each cell in your body is covered in proteins known as receptors. These receptors help the cell to survive by allowing various molecule sot bind to them and work out necessary interactions that provide the cell with energy. The numbers and kinds of receptors make a long list. Each type of cell has receptors or sets of receptors that are particular to it. For instance, the cells that make up your kidney have some receptors that are specific to them and are not found on liver cells or skin cells. Stem cells have their own distinct receptors on their exterior surfaces. This distinction allows scientists to easily identify and tag such cells. Were it not for the existence of these markers, scientists would not have made so many recent advancements in their study of stem cells. Each marker has a name based on the molecules to which it binds. How Do Scientists Identify Stem Cell Markers? There are many different ways to use stem cell markers in scientific study. Two approaches are outlined here. One involves the use of a technique known as fluorescence-activated cell sorting (FACS) and the other method uses the fluorescent tags on these markers to identify and assess the condition of stem cells present in tissues. • Scientists frequently use FACS to distinguish stem cells from the millions of cells present in any view of tissues or organs. The process begins with a nozzle that is so narrow that it will only allow the exit of one cell at a time. As the cells exit the nozzle, they pass through a beam of light. Stem cells, which have been previously treated with fluorescent markers, become negatively charged as they pass through the light. Other cells take on a positive charge. • When scientists wish to see how stem cells act in tissues under a microscope and cannot use the FACS device, they remove a thin slice of the desired tissue. Stem cell markers are tagged with an injection of signaling molecules with fluorescent tags. Observers activate these tags with light or chemical energy. The fluorescent light emitted by stem cell markers is visible in the microscope. Scientists have also begun to study the possibility of identifying and studying stem cells without having to rely on the identification of their markers. However, this method had been useful for a considerable period, given the short amount of time in which stem cells have been identifiable. Stem cell markers will certainly remain an important method of identification in research.